A lot of articles out there on the web jump right into tips for increasing conversions (shortening form length, using high-contrast CTAs, optimizing web copy, etc.) but they rarely ever take a step back and provide you with the core understanding of how your conversion rate works and the key contributors and levers that influence it. Let’s get the obvious out of the way: a conversion on your website is when someone fills out a form in exchange for some value (an eBook, a conversation, a case study, etc.). They usually fill out these forms on landing pages. There’s a well-defined multi-step process for how your typical visitor ends up on that landing page and fills out that form. After reading the landing page, they decide to fill out the form in order to receive what is promised. Once you understand the process that virtually every anonymous visitor goes through, you can start to identify where you are weak at and how you can tweak conversion rates and increase leads. There are three fundamental ways to increase the amount of leads. Improve the number of people that end up on landing pages (through seeing and clicking a CTA). Improve the number of people who fill out a form on a landing page. Think of each of these as levers you can pull in order to increase lead volume. Now, it becomes much easier to identify problems and solutions, rather than willy-nilly making changes and hoping something sticks. Here are some guiding questions (and some tips in the form of a rhetorical question ;) to get your mind moving in the right direction. Low leads? You might just not be getting enough traffic, period. How much traffic have you been getting recently? How does your traffic compare to last month, the average of the previous three-months, and the same month last year? If traffic is the source of your problem, how might you increase it? Have you been blogging recently to continue to gain traction with Google and SEO? Are you blogging at least twice a week? Are you blogging about problems your prospects are actually facing? Do you have budget to supplement your inbound activities with paid activities (PPC, display advertising, etc.)? Have you tried creating a singular amazing content piece (an industry survey/report, an infographic, etc.) to increase social shares and web referrals? Have you tried email marketing to increase return visitors? Are you promoting all of your posts in social media? Are your employees active participants in sharing your content? Have you reached out with other bloggers to build symbiotic sharing relationships? How are you promoting the email subscription? Low leads? You might not be sending enough of your traffic to landing pages. What percentage of your overall traffic ends up also viewing landing pages? 10%? 20%? How can you increase the number of people who go from basic visitors to landing page visitors? How many whitepapers/eBooks do you have? Do the blogs you’re writing have an additional content piece (whitepaper, eBook, checklist, compliance guide, etc.) that goes more into the topic in depth? Do you think you have enough content offers in order to have something different visitors (with different problems and interests) will be interested in? Are you using CTAs on (almost) every page of your website? Are the CTAs relevant to the page? Do the CTAs have a clear call to action (“click here to access/read more”)? Are the CTAs easily noticeable? Are you using those CTAs at the bottom of your blogs? Have you tried using those CTAs in the middle of your posts, instead? Do the CTAs utilize colors that contrast against the color on your website (like lime green buttons on a navy blue background)? Have you tried using a red button? Have you tried changing where you place the CTAs on the page? Is the text on your CTA enough to intrigue someone to click to the landing page? Does your CTA clearly promote the value proposition of your offer? Is there a way to send traffic directly to the landing page? Have you tried to push those landing pages up the google search rankings? 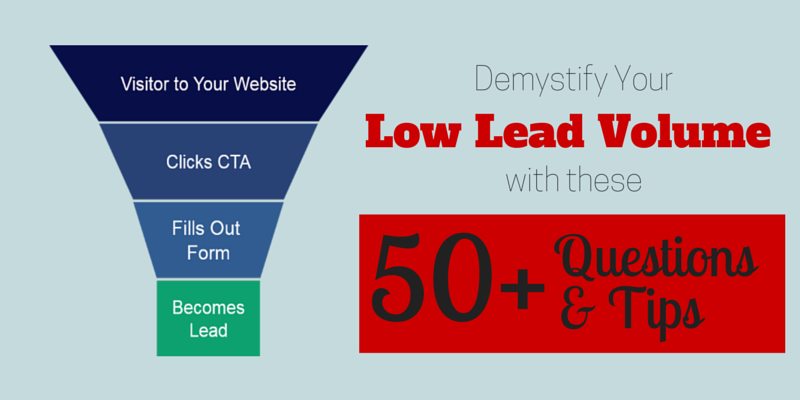 Low leads? You might not be inspiring landing page visitors to fill out the form. Is it clear that the person is supposed to fill out the form? Do they notice the form right away? Do you have a background behind the form to make it contrast? Are you still using “submit” as your button text? Have you tried a simple “click here” for your button text? Does the landing page have a clear value proposition? Does the visitor know what they will receive in exchange for the form submission? Are you using headlines to clearly identify the problem this content/offer solves? Are you using too much text? Are you using too little text? Are you using just a wall of dense text? Are you using bullet points? Have you tried using the word “free” on the page? Is your form too long? Are you asking for information you don’t really, truly, need? Are you using a preview image? Are you using a video on the landing page? Does the value proposition on the landing page match the value proposition on the CTA? If you’re struggling with leads, it’s incredibly helpful to have a fundamental understanding of the process people go through to become a lead. Through this understanding, you are able to tweak the three core levers that affect lead volume. The 50+ questions above should help you ask the right questions to make the right changes, to implement the right tweaks. As always, if there is any way I can help, don’t hesitate to just shoot me a message via our contact us form. I’m always happy to talk with other inbound marketers and help them identify ways to reach the next level in their marketing.